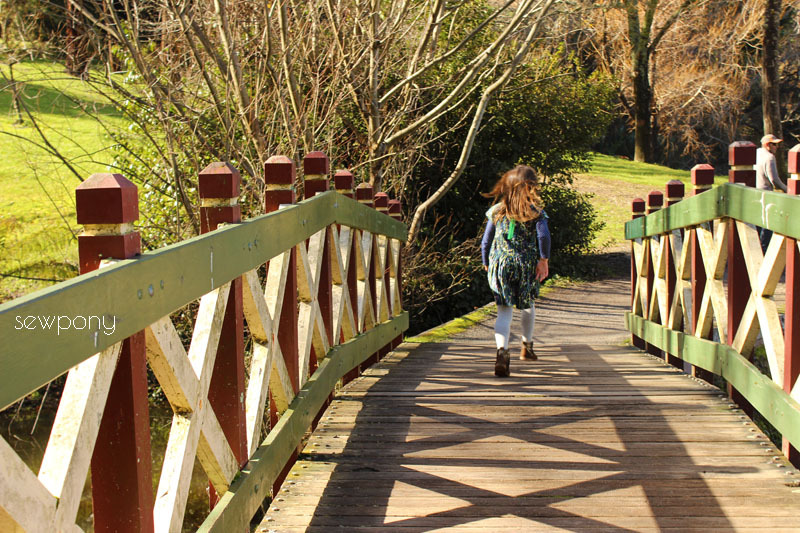 This weekend we went away to Daylesford - a picturesque little town set amongst hills, beautiful old buildings and a big lake. 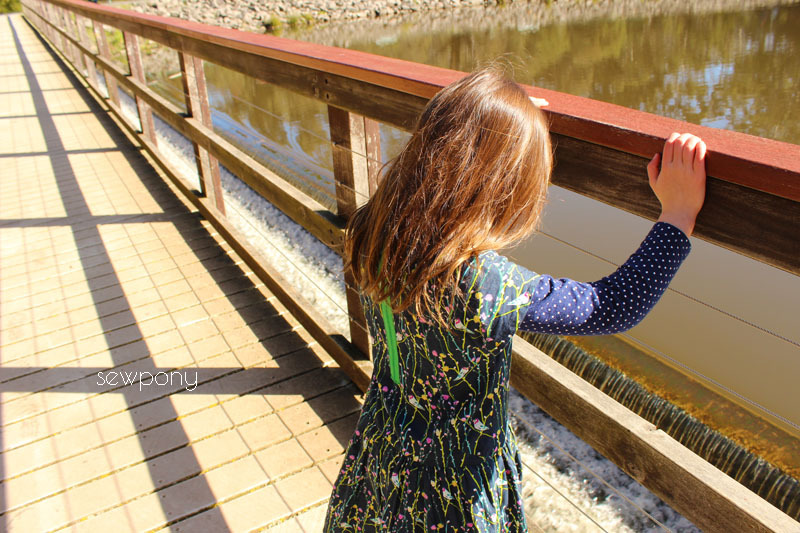 Today we went down to the lake and I realised it was the perfect place to take some photos of Juliette in her new Antalya dress. 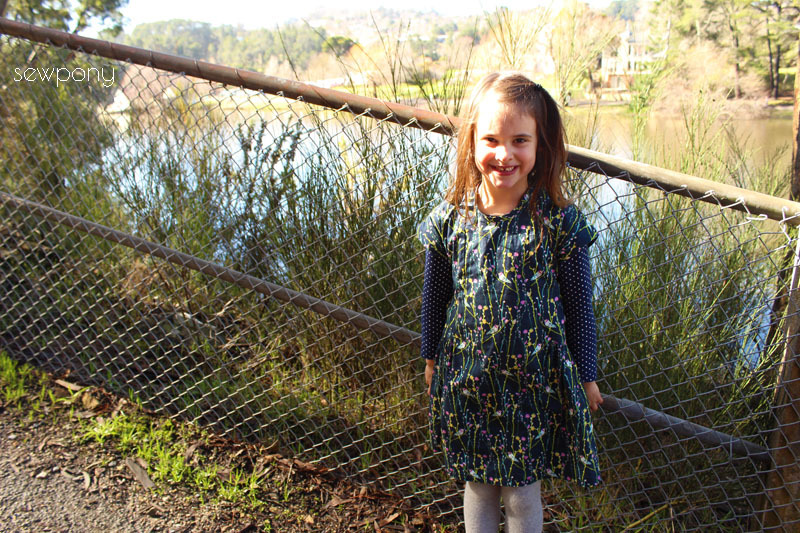 I finished this dress a couple of weeks ago and Juliette loves it. I hadn't planned on taking photos of her today but since she was wearing the dress and I had the camera in the car, I decided to take some pics. And although Juliette's hair could look prettier, here is the dress. Sometimes things can be perfect! The walk around the lake was so pretty and the weather was perfect - better than yesterday when we were buying gloves to keep the girls' hands warm. We have had such a wet winter...I am really looking forward to the sun being around some more! 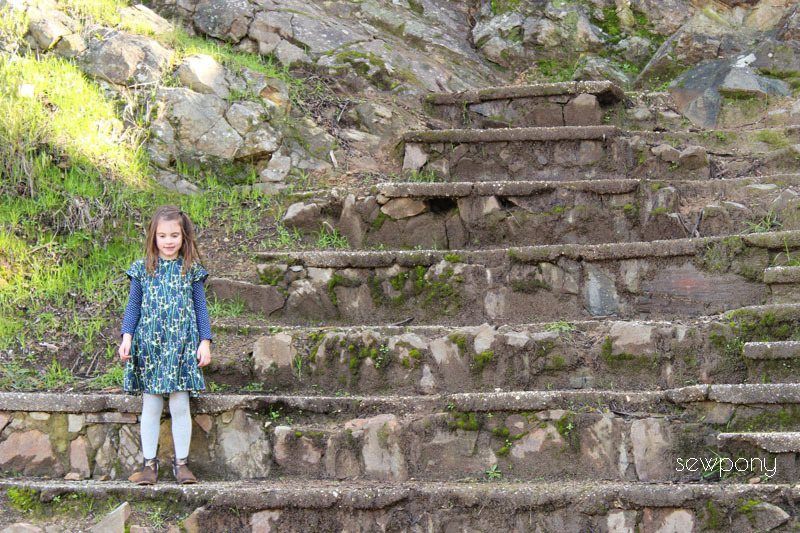 The Antalya dress is a great pattern and design. 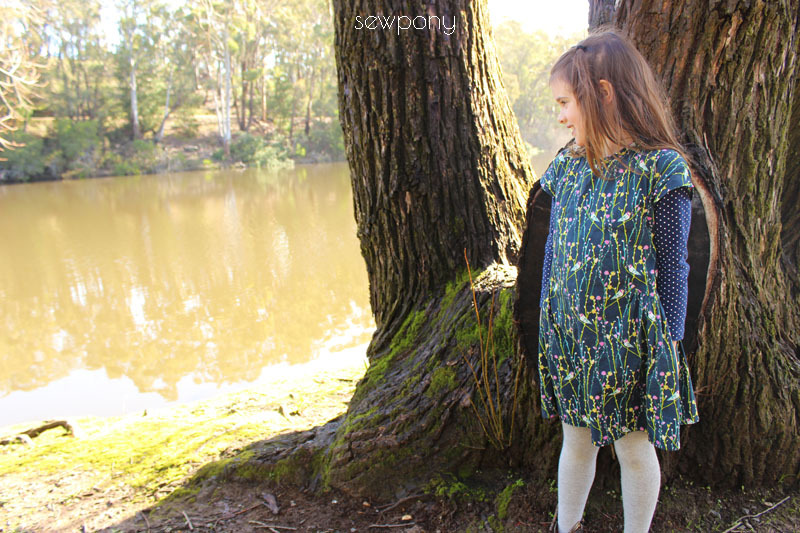 I tested it for Olga from Coffee + Thread when she first released it for Willow + Co. The only change I made was to use the shorter size for the length of the skirt. I used size 6 for Juliette who is very typical in proportion for her age/height. I cut the skirt as a size 5 as I remember a few of the Antalyas I had seen around looked a little long for my taste. 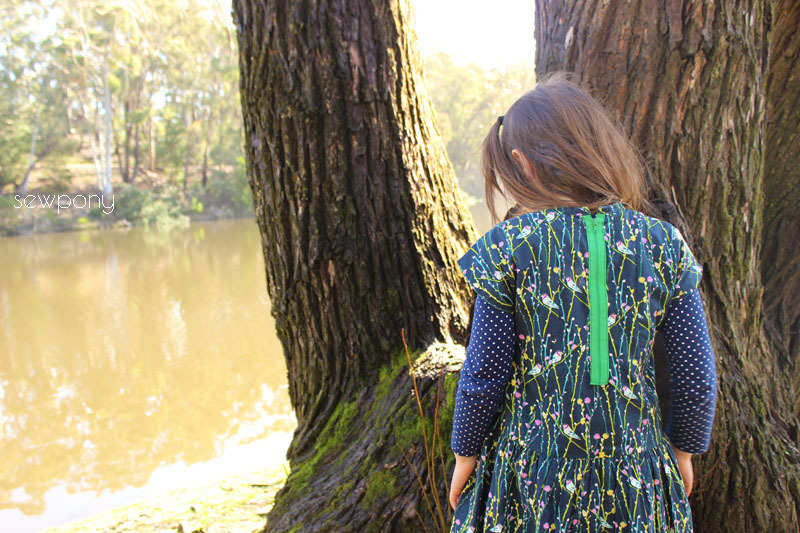 My favourite part about the Antalya dress is the exposed zip at the back - such a fun detail. The fabric I used is Illusionist vine in Tui by Bari J. Ackerman for Art Gallery Fabric. I had the zip on hand. Juliette calls this her 'birdie dress' and has worn it about six times in the past three weeks (we have had school holidays - so a break from uniform, in that time). 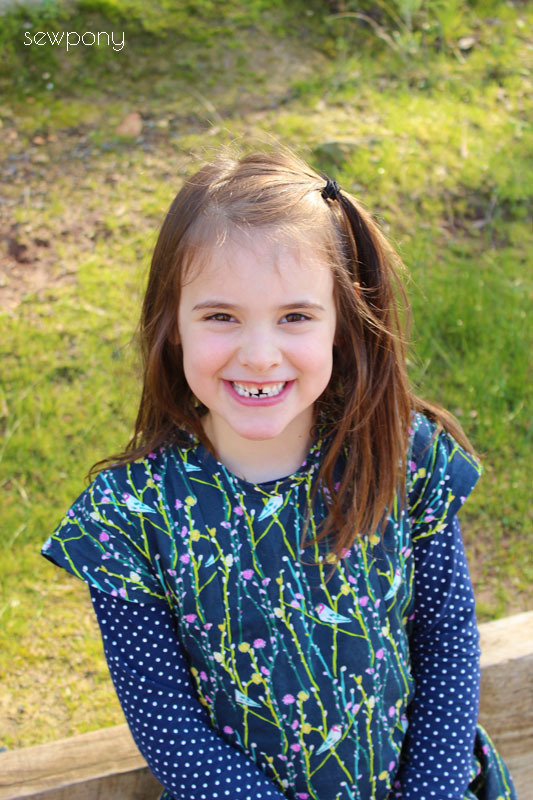 I enjoyed making this dress so much that I made up another one for the girls' cousin, my sweet niece, Lucy, who's ten. I hope to post an instagram pic of it before I send it down to her. I can highly recommend the Antalya dress as a unique and pretty dress that is really quick to make. You can buy your copy here! Love love the fabric your chose, so pretty! The green zipper is perfect for it too. Beautiful! Thabj you Olga. Its a great pattern! Such beautiful fabric, and I love that green zip! It is such a lovely dress. My girlie would have loved the birdie fabric also :) It's been ages since I have been to Dylesford last. It is such a unique place.